Falang Sonko of the United Democratic Party (UDP) of KMC, has taken a rather optimistic view of the current spat between the UDP and the supposed Barrow second term proponents. 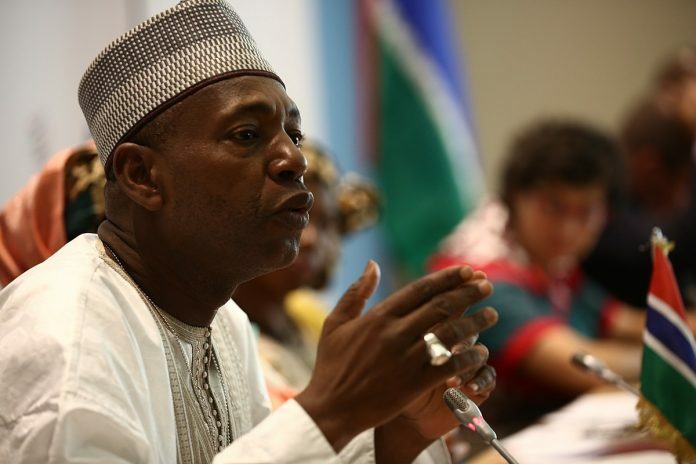 Sonko described as ‘hypocrites’ those interfering in President Barrow/UDP affairs, adding that he is sure that the Gambian leader will not betray his native political party to form a new party. Sonko, a die-hard UDP member who was among militants arrested for alleged illegal gathering in 2014, said there is strong possibility that all the noise would result to nothing and when the dust finally settled, those creating or feasting in the seemingly muddy waters would be put to shame. The UDP militant personally singled out NRP leader and minister of Tourism, Hamat Bah, saying he should shut up. “He is saying that Barrow cannot fit in anyone’s pocket but if a good son can fit in his father’s pocket that should be a pride for the son. He warn that people should stop interfering with UDP affairs, because no one can destabilize the UDP. They will try but they will fail miserably. Take Jammeh as an example, how much money and energy did he spend in trying to destroy the UDP, but all went in vein?” Sonko quizzed. Sonko further called on UDP supporters to tighten their belts because there are more challenging days ahead in the country’s political spectrum. 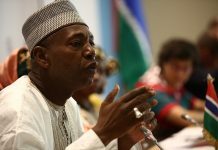 “There are more trying times ahead because many people are beating their chest now claiming that they have The Gambia at heart. UDP supporters should just avoid engaging in anything that will destabilize this country,” he advised. Meanwhile, the party’s new National Youth President Hon Sulayman Saho, said Gambians should realize that there will never be dictatorship in The Gambia again. Saho also took time to throw his opinion on the recent gun saga, saying that the news of the guns broke fear that engulfed the people and therefore the whole affair should be made clear to the Gambian people. Also speaking at the rally, the UDP Senior Administrative Secretary, Hon Lamin Dibba, called on Gambians to stop provoking one another, saying the UDP will not allow anyone to destabilize the country. “We all have seen what happened here during the political impasse, so we should all ensure that this country remains peaceful and stable. We will not allow anyone to spoil the peace and cohesion the country is enjoying now,” he said.